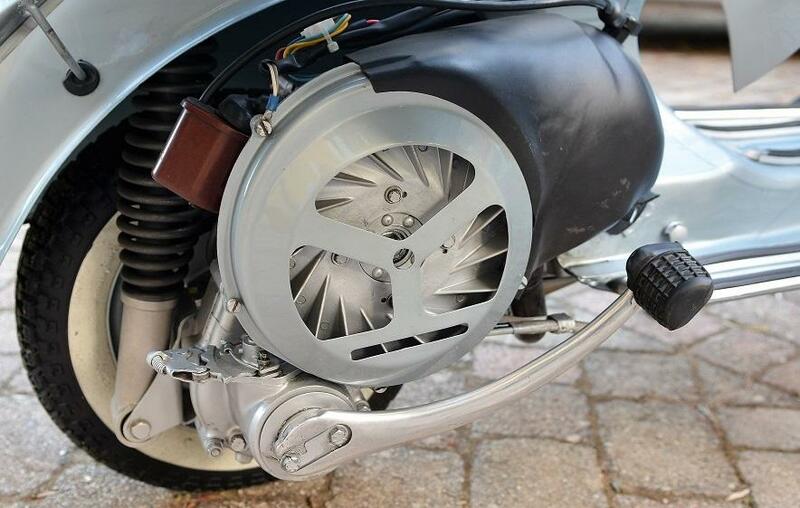 Here at Wessex we are fans of using original Piaggio/Innocenti parts where at all possible, they are high quality parts, factory produced in Europe, and generally fit well and have a long service life, a well set up standard scooter from any era should be reliable and easy to live with, but there is an exception to the rule. The Italians have a saying which translates to..
"The Vespa was designed by the gods but the Vespa electrics were designed by the devil!" 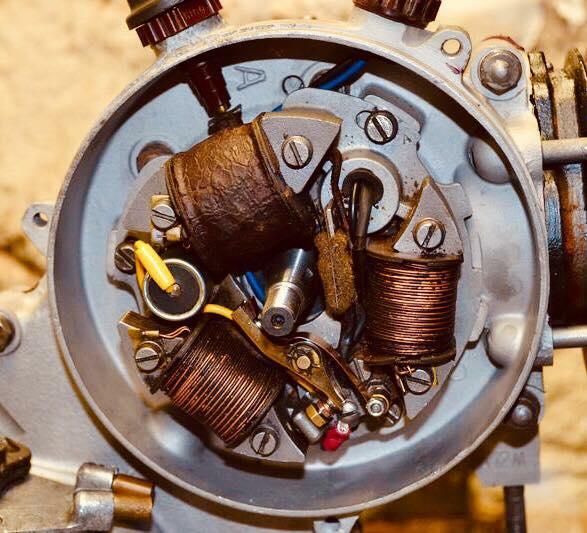 But in our humble opinion, the electrics are the biggest Achilles heel of the Vespa engine, the gearbox and top end are very strong and go on forever but we see more electrical failures than anything else. 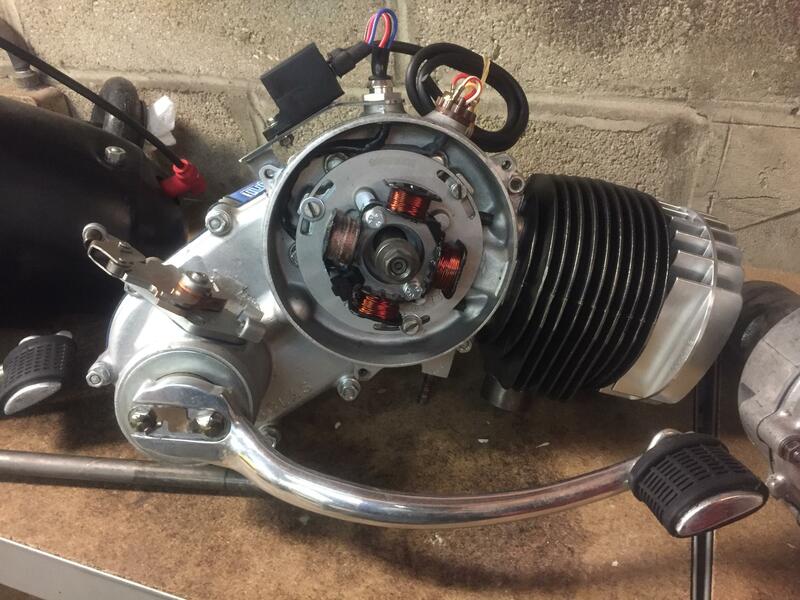 When we go back to the dawn of Vespas you can see the gradual evolution, originally the ignition coil was mounted on the stator plate under the flywheel, the problem with mounting it here is that it gets very hot and the heat expansion in the copper coil wire would very quickly show any weakness and leave you stranded when the engine was warm, normally 10 miles away from home! Later Vespa Wideframe engines moved the ignition coil to an external location on the outside of the engine, this helped to stop the coil from over-heating. Now 60 years down the line many of these original 6v systems have issues, some are due to cracked wires, dodgy condensors, incorrect points gap, flywheels losing their magnetism and of course ignition coils breaking down, you can often spend a lot of time, money and effort trying to rescue a 6v system which even when working well has poor light output, and it also seems that some of the remade parts for 6v stators are not made to the same quality as the originals and some can fail straight out of the box. There's also only one shop in the UK as far as we know who can remagnetise a Vespa flywheel and that's Scooterworks in London. Try as we might to keep 6v systems working, it can often be a frustrating exercise which ends in disappointingly premature failure. The use of easily available PX style flywheel puller and Pinasco's own flywheel holding tool, this does away with the rubbish self extracting circlip used on early Vespa engines. 1.6KG flywheel - this is medium weight so has enough inertia for a standard engine but also light enough for a performance engine which may need a quicker response. Magnets sealed behind a plate and the flywheel, this means that should a magnet ever come loose it is shielded from destroying your engine casing. Variable ignition - the ignition retards over 8 degrees as the revs increase which allows the engine to stay cooler and keep maximum power. DC output for batteries - this allows you to charge a battery and run a sat nav, phone charger or any other gadgets from a battery which will get charged as the engine runs. If the electrical system does fail then normally it's just a case of changing the CDI or changing the coil cluster on the stator, both very easy jobs which require far less time and frustrating fault-finding when compared with checking a 6v points setup. While the Flytech isn't perfect - it's not totally plug and play, you need to cut and route the wiring and the GS150 kit comes with the wrong CDI bracket, these are minor issues and once fitted you can forget the electrical woes of a 6v system and enjoy the world of bright lights and easy starting!